Fifth-grade reading teachers Karen Sisk and Leslie Amerson document the books they have read so far. The fifth-grade reading teachers at P.E. 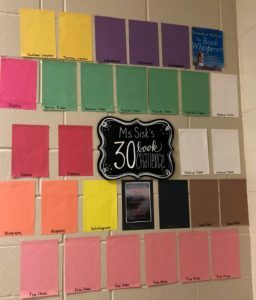 Wallace Middle School have issued a challenge to all of their students: read at least thirty books by the end of the year. 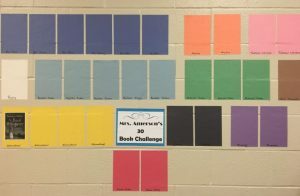 In the challenge, students must choose books on or above their reading level and from poetry, realistic fiction, historical fiction, fantasy, science fiction, traditional literature, informational, biographies, and autobiographies. Those categories make up twenty-four of the thirty books. Students can choose any book for the other six. The teachers themselves are participating in the challenge as well.